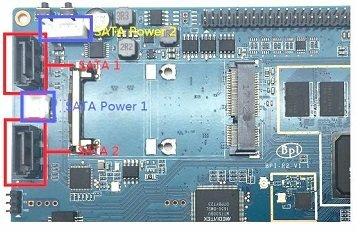 BPI-R2 support 2 sata interface and onboard power port. Let's get start to develop on BPI-R2, see amazing things happen. * Execute "git clone git@github.com:BPI-SINOVOIP/BPI-R2-bsp.git"
2. Execute "./build.sh", to build your own uboot and kernel. 3. After finish built, Execute "cd SD", plug your Ubuntu TFcard in PC. 4. Execute "bpi-update -c bpi-r2.conf -d /dev/sdX", to update the compiled kernel to your TFcard. 1. Clone OpenWrt project from Github. * Execute "git clone https://github.com/garywangcn/bpi-r2_lede.git"
2. You need to have installed gcc, binutils, bzip2, flex, python, perl, make, find, grep, diff, unzip, gawk, getopt, subversion, libz-dev and libc headers. 3. Run "./scripts/feeds update -a" to get all the latest package definitions defined in feeds.conf / feeds.conf.default respectively and "./scripts/feeds install -a" to install symlinks of all of them into package/feeds/. 4. Use "make menuconfig" to configure your image. * Choose "Target System" to config as "MediaTek Ralink ARM"
* Choose "Boot Loaders" to config as "u-boot-bpi_r2"
5. Execute "make -j1 V=s" to build your own OpenWrt image. 6. After built, we have two ways to install image. (2) Write image to TF card, execute "dd if=mtk-bpi-r2-SD.img of=/dev/sdX"
7. This step is for upgrade, if you don't want to install image after you built, you could use runtime upgrade. * Copy "bin/targets/mediatek/32/lede-mediatek-32-bananapi,bpi-r2-sysupgrade.tar" to R2 board which is running OpenWrt system(no matter where(SD or EMMC) it boots from), and then run command "sysupgrade lede-mediatek-32-bananapi,bpi-r2-sysupgrade.tar" to update both kernel and rootfs. create your hostapd.conf: "vim /etc/hostapd/hostapd.conf "
Config dhcp of ap0, then the devices which connect ap0 could get IP: "dhcpd ap0 -pf /var/run/dhcpd.pid "
Plug your SD card in Linux PC, "cd /media", then "ln -s <your account> pi"
Execute "bpi-migrate -c bpi-r2.conf -c ubuntu-mate-from-sd.conf -d /dev/sdx"
This page was last edited on 21 March 2019, at 00:31.